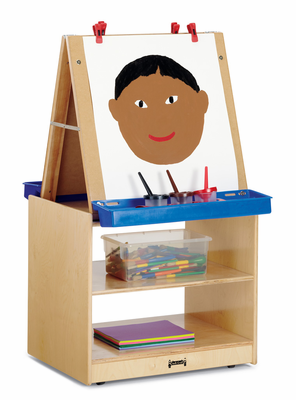 Get full use out of your class or work space with this highly functional and durable art center for two. Your children will love time at this just-right-sized paint and art workplace. The Jonti-Craft® 2 Station Art Center is build solidly with standard hardboard easels that provide two work independent work areas. The easels can be easily removed and can be upgraded with optional acrylic, chalkboard or the popular Write-and-Write panels. The functional design provides great, easily accessible storage space. The included and portable clips and paint trays make it fun and easy for young folk to keep everything they need handy. This art center is another fine product from the highly respected Jonti-Craft, the company that has been providing quality wood art and crafts items for more than 30 years. The innovative a products from Jonti-Craft are designed and made in the USA and made from premium materials to ensure long and reliable use.